Back before school started, I was helping Maaike paint her room a lovely, androgynous shade of purple, and we got to talking about feminist icon Gloria Steinem’s visit to Austin. Soon my secret past as a Women’s Studies undergrad and feminist activist came to light, and we began discussing gender as it might relate to preschoolers. Maaike thought it would make for a good topic of discussion with all our classroom parents, and I agreed to help “lead” the discussion. So late one Tuesday night in October, we all got together to talk about gender, as it relates to preschoolers. I have to admit, in the days leading up to our meeting, I wondered how relevant the topic of gender might actually be for a room full of five year olds. Concerned as I have been about social justice and human rights, especially putting an end to bullying and hate crime, it just didn’t seem like an issue yet. But boy (and girl, and beyond) was I wrong. The minute I thought we’d already escaped the usual stereotyping just by being awesome, my son said, “Mom, I don’t like girls.” Luckily for him he added, “Just kidding.” Then ran off to fire his new raygun. And bake cookies with his dad. For me, parenting is like keeping an eye on the weather; I live in a state of constant and often unexpected change, though I try to be prepared for anything. But how much more is there to gender when it comes to preschool, beyond Pink and Blue? As it turns out, a lot more than I thought. Maaike has over thirty years of experience as a preschool teacher in some very different cultures – African, European, and Texan. She is the mother of three grown children. To start our discussion, she handed out photographs of her kids when they were little, pointing out how she, as a mother who’d grown up in the Netherlands, dressed her male and female children against gender stereotype almost by default. That is to say, her girls often wore pragmatic “boyish” clothes, and her boy sometimes wore more typically “girlish” clothes. She quickly found that what she was doing was raising some eyebrows in her community of Austin, Texas. But she continued to dress her children in ways that made sense to her, and allowed them to choose how they would express themselves. Our discussion got interesting and lively. We wanted to make clear that a talk about “gender” did not necessarily mean biology, or even sexuality. We really wanted to address the concept of gender as defined by society, and how our children were just starting to make sense of messages they were receiving about what is acceptable behavior along gender lines. One mother was concerned about “princess pressure” on her daughter from a well-meaning neighbor. Another mother was stunned when her son said, matter of factly, that “only girls can spin, not boys,” when it came to dancing. (She quickly scheduled an afternoon visit to a Ballet Austin rehearsal and brought home books on Baryshnikov.) Another mother told us how, when she was a child, she loved playing with dolls…but that her Barbie ran a business empire. We shared story after story of our boys with long hair being called “she” at the grocery store, or girls with short hair being called “he.” And none of us were overly concerned by all that, except of course how it might be affecting our children. Another mother brought up the issue of gender roles in the home, and how meaningful it was for her to always call her stay-at-home-mom work “Work,” to let her daughters know that what she does is, in fact, Work. Paycheck whatever. That resonated with just about everyone, full and part time workers outside the home included. The more we talked, the more we realized how important it was to become more aware of gender stereotyping at home and in public, and how it might be affecting all of us. Consciously or not. 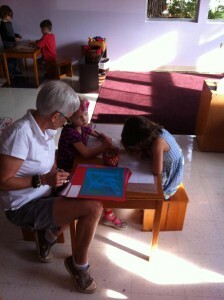 Maaike explained that she purposely set the classroom up to be as inviting as possible to our children. And yet somehow, in the context of gender, all the books on the shelves suddenly seemed so…old-fashioned. One dad, one mom, a boy in jeans, a girl in a dress. Girls playing with baby dolls, boys playing with trucks. Where were the books on children with single-parent households? On families with two mommies, two daddies, extended families, bi-racial families, adoptive families, boys who liked to wear tutus, girls who would rather play baseball than (even CEO) Barbie? How often, as helping parent or teacher, did we tell a little girl that she looked “pretty” today? 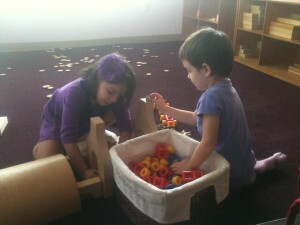 Did we encourage boys to get involved in the dramatic play area, or girls to jump in and enjoy the Lego corner? When working with teaching our children how to set boundaries, were we clear about how to say “No!” when someone is being chased or teased against their will, or how important it is to teach both boys and girls that “No!” means “No!” and that the chase stops there? 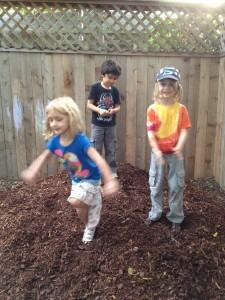 It’s a common playground moment that becomes a valuable lesson for everyone. So how do we, as co-op parents, work with ideas about gender and stereotypes? We all agreed that context, as well as consciousness, was key in helping us (and our children) wade through the heteronormative (the assumption that a hetero, or male and female pair, is “normal”) culture of toy catalogs, library books, media, holiday gatherings and neighborhood block parties. As the parent of a preschooler who is an only child, I haven’t had to worry just yet, not really, about overt bullying and cruel teasing from other kids. Or adults, for that matter. But I am very determined and hope that my child, all children really, will grow up feeling safe and respected and without shame for who they are or who their parents and/or family and friends happen to be. And of course I want my son to be happy. I want him to feel free to paint his toenails or paint zombies, to love whomever he loves, to accept all parts of himself, no matter who he blossoms into being. I’m extremely grateful to Maaike and to our co-op community for creating the opportunity to share this information – a couple of the parents said that the discussion really opened their eyes to some unconscious and unexpected tendencies toward stereotyping – for wanting to create a welcoming environment where everyone is encouraged and supported to truly be themselves. As part of our ongoing effort to expand awareness, our class and Nadia’s class will be going to see the interactive children’s play “And Then Came Tango,” written by a UT graduate theater student and based on a children’s book (and a true story) about two male penguins raising a baby penguin together. After one performance at Lee Elementary, the remaining ten performances of the play were canceled by a group of AISD officials and parents who were concerned about its content. More about the cancellation of the play, “And Then Came Tango”.